1. When i export all, instead of downloading the file, i go to a page: 403 Forbidden nginx/1.12.2. 2. When i try to edit an autofill booking, i press change your booking and it does not change. Nothing happens, only the page slightly slides up. 3. When i deactivate the "send email" button, so i dont want to send an email when i do a booking, the email gets send anyway sometimes. So the button "send email" does not work. 1) You need to recheck your server configuration to be sure in having access to that file. Its seems that your server block access for direct access to PHP files in wp-content/plugins folder. Please contact support of your hosting, let they recheck your server configuration and allow this action. 2) Try to recheck .htaccess file about any rules that block access of creating new files or folders at the wp-content folder. If you do not sure about correct configuration, please contact support of your hosting company or your server administrator for resolving this issue. 3) Its can because you are using some security plugin or other security system. So please try to deactivate one by one all your active plugins at the WordPress > Plugins menu and make testing after each plugin deactivation. Otherwise, Please recheck your error.log in your server configuration, about any relative errors. If you can not find error.log file, please contact support of your hosting company about helping in finding this file. C) Where do you deactivate this button ? Is it at the Booking > Add booking page or in Booking Listing page ? Please be sure to update your version of Booking Calendar to the latest update 8.4.6. Then test it. Email different from website DNS, its can be a reason of not delivery emails. Please use the email withing the same domain as your website! I purchase the business large version and I can't seem to get anything to work properly. I have a multilingual wordpress blog (in english and german lang) and I would like your plugin to be not only in english language but in german also - how do I change it to german language ? I have this plugin configured to show in a Featherlite lightbox, and everything works except users can't click the button to see next month. Probably there some CSS issue with your theme or other plugin. Please send the link to your page with booking form, where you are having the issue. My form displays the secondname twice instead of name and secondname. The email sent is when booking is ok, it's only on the form that is displayed with the Paypal Button after clicking on "send". Can you help me fix this? I can send you print screens. 3) You just need to be sure to use the correct names of shortcodes there, like in my example. Unfortunately, Booking Calendar does not support datepickers. Sorry. Booking Calendar support only inline month view calendar for dates selection and then submitting the bookings. 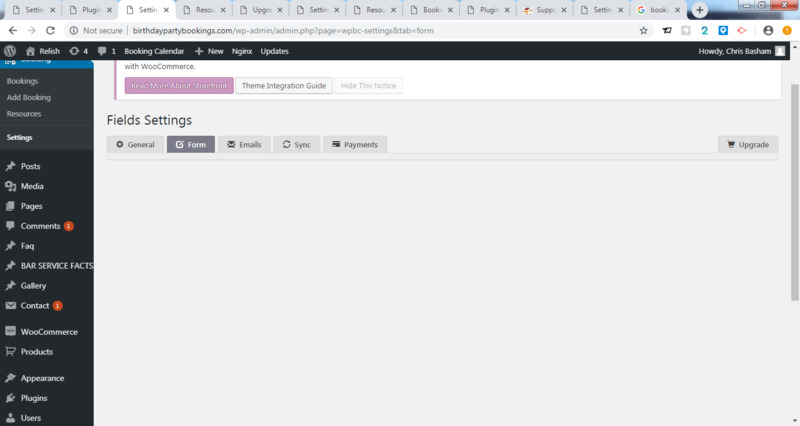 after i created a new form with standard option i am getting blank page. i have deactivated all the plugins and tested again but no luck even i am not getting any error by using in console can you please help me. 1) Its seems like something was saved wrong during configuration of the booking form. Please try to make the FULL reinstall of the Booking Calendar. To make FULL reinstall of plugin (its mean that ALL booking data will be erased). For this please open the general booking settings page and make checked the "Delete booking data during deactivation of plugin" at the right side of the page. Click save changes button. Then open the WordPress plugins menu and click on "Deactivate" link. Wait for the message that plugin is deactivated successfully. After this test it again. 2) Otherwise, Please recheck your error.log in your server configuration, about any relative errors. If you can not find error.log file, please contact support of your hosting company about helping in finding this file. Is it possible to add backdated bookings? I had someone stay, and arrange it by email without filling in a booking. I want to now update our records so the booking is shown on the system, but dates in the past are greyed out! Is there a way around this? where server.com have to be your server url. The trick here is to having this parameter &booking_hash at the end of url at Booking > Add booking page. So you will be able scroll to past month and add new bookings. Its works only for admin panel at Booking > Add booking page . How can I properly use a license, if I do a project locally and periodically upload it for production, do I need to buy a license for a local project and for production? Usually for such type of configurations you need to purchase the Booking Calendar developer edition version, which possible to use on 2 different websites. But if you need to test / development it on the development website for the limited time, then its possible to make such type of testing and then moving "single site usage version" of plugin to the "live website". Its possible to make such transfer only once. And of course you need to delete the version of plugin from the development website. Otherwise, you need to purchase the "developer edition" version, which possible to use on 2 different websites. Okay, but i develop site on local machine - sitename.local without hosting! What links i need provide to support? Please provide this data and URL to real website. Please send this info to support @ wpbookingcalendar.com by email. If I want my customer to pay 50$ per unit/visitors per day, which form do I use then? ( 50 * day * visitors ) or how? I have the large business model. You can define the cost per days at the Booking > Resources page as 50 USD per day. No, I mean - this is an extra optional fee to pay if you add some extra items to your order. But in my case the numbers of visitors is numbers of CANOES. And the customers has the option to reserve some extra items to the price of 50$ pr. day - but they may have the opportunity to book the extra items for more days. How do I add this under the section ressources - advanced costs? At the Booking > Resources > Advanced cost page you can select for each selected options the cost as "$ / day". So this additional cost N that you have specify for specific option will multiply to the number of selected dates. Under coupons, the "expire date" - is that the date of last time to write the coupon for bookings or do you have do use the booking before this date? I mean if I the expire date of the coupon is 1. April 2019 - is it possible to make a reservation for the 10th of may if you just make the reservation BEFORE the 1st of April? Do you understand what I mean? Its "the date of last time to write the coupon for bookings ". "... the expire date of the coupon is 1. April 2019 - is it possible to make a reservation for the 10th of may if you just make the reservation BEFORE the 1st of April? ..."